Oh joy! The Spanish movie website Estrenos deCine has posted yet another fun photo of Peter Jackson and Steven Spielberg together on the "set" of The Adventures of Tintin: The Secret of the Unicorn. This time, though, they're wearing bowler hats while they work! As far as I know, Paramount has not yet fired up the marketing machine for Tintin in the US. There is a lot of media floating around internationally, because Tintin is a much more well known character elsewhere, but here in America it's all still quiet. I think they're waiting for the right moment to introduce us to him, but for now, these are the kind of photos we get to see! We last wrote about The Adventures of Tintin way back in April and featured the first behind-the-scenes photo then as well. This motion-capture CGI movie stars Jamie Bell as Tintin, Daniel Craig as Red Rackham, Andy Serkis as Captain Haddock, Simon Pegg and Nick Frost as Thompson and Thomson, Gad Elmaleh as Ben Salaad, and Toby Jones as Silk. The first film in the planned trilogy finished shooting for 32 days back in March. We hope to see more from this, including an actual photo from the movie, sometime soon. Tintin is currently scheduled for release in America on December 23rd, 2011 (a very long time from now). I love Tintin. Here in the Netherlands his name is 'Kuifje' and his dog's name is 'Bobby'. Oh man, I watched the television series so many times, it's awesome! You're kidding right? This was a massive picture in May's (Steven Spielberg's edited) copy of Empire which Im sure you've all read. Nothing to see here people, back away. I am very much looking forward to Tintin though. Cant wait to see this in OVER TWO YEARS!!!!!!! Jeez, December 2011?! You run a movie blog - and you don't read EMPIRE WTF?????? This is not the first time you do this Alex ! I don't want to speak but you are doing a lot of mistakes and most of your reviews are just sh*t ! but I appreciate that you are doing it for informing us nothing ells but please be careful next time . I grew up reading Tintin, I just think maybe it might be a bit quaint/dated for modern audiences?!? *sigh* Give the guy a break. Start your own movie news website if you're unhappy with it. I bet there will be a lot more mistakes. You all think because you can post two sentences that automatically makes your opinion worthy. Just read it for what it is and say something smart about the article. That's what these posts are for.. to talk about movies.. not about heckling the writer for posting a picture that was in a magazine 5 months. who cares. I'm not saying I agree with every article but I'm objective enough to read it for what it is. If you've seen it already.. then move on. Maybe some people haven't and to them this is news.. like myself. By the way.. I use to read TinTin comic books and watch the french movies all the time as a kid. Really looking forward to this one.. I think posting anything for a movie that doesn't come out for another 25+ months is absurd. If you just HAVE to post something make sure it has more than one picture and it's not crappy and it actually shows something from the movie. Or post an interesting article about casting, storyline, etc. #7, I am not saying that I can do a better job. I am trying to give the operators some contrusctive criticism. If the site was bad I wouldn't come everyday. @ #9 I disagree. I think posting something 25+ months in advance, articles about movie history, the post about IMAX screens the other day, future of 3D technologies, Brandon writing opinionated articles about something or nothing at all.. is why I keep coming back. Because there is always something different. It's what makes this site different from the others. If all Firstshowing.net did was post formulaic, generic posts about casting, storyline then it would just be the same thing as every other site. For example.. Totalfilm.com has a feature section on movies that is so random and sometimes hilarious and is why I go back. This IS a picture from the movie..behind the scenes. I for one like all aspects of filmaking. 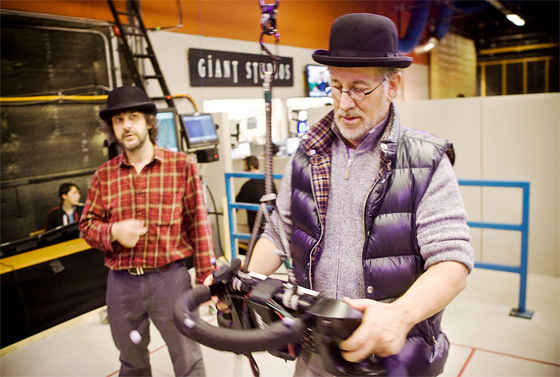 To me it's interesting to see Peter Jackson and Steven Spielberg working together on a set. If all I wanted was in film pics and plots synopsis I would to imdb. I am a big fan for this site but this truth will not stop me to say the fact the mistakes and the bad reviews are all around and almost in every article and as much as the fans and the people who write here are tired from the mistakes and the wrong news specially those RUMERS stuff i don't think they wrote much about the information it self . we are living in a world of criticism we must be right and true to everyone around us . you can't just fill your site with news and images without thinking about it or seeing it first . "If all I wanted was in film pics and plots synopsis I would to imdb." Then you should go there cause this article doesn't say anything besides cast, release date, and that nothing has been said in America about the film. "Another Fun Photo." Uhhh what? Maybe explain where they're at, what Spielberg is holding/doing? If Alex doesn't know this, then don't post the article and especially not the picture. I agree that this site does have interesting articles, but this is not random or hilarious like what you said about totalfilm.com. This is an article about nothing and shouldn't be on this site or any others. It is meant for imdb only. AND THIS MOVIE STILL DOESN'T COME OUT FOR ANOTHER 2 FREAKIN YEARS!! #2 - I'm 80% certain this photo is new as I don't recognise it but I don't have my copy of Empire to hand to check. Here is the link to the previously release photos in Empire: http://www.empireonline.com/News/story.asp?nid=24608 #5, #9 and the other critics - This is the first time I've visited this blog and I'm sure you are right, there will be lots of mistakes. This is the nature of blogging. Checking facts is hard and it is very time consuming. In the film business, it can be impossible because most of the "facts" are based on off-hand remarks for a director or star. For instance, there are going to be only two Tintin films, not a trilogy as the article suggests. The reason everyone thinks there are three films is because that is what the original announcement said. It was only later, after the funding had been sorted out, was it decided that there would only be two films. Yet most web sites, even authoritative ones, still report there are going to be three films. The only reason I know there will be two films is that I run TintinMovie.org, a blog all about the Tintin films. I do read all the press releases and interviews and track every mention of Tintin on the net (which is how I found this blog). This is incredibly time consuming even for two films. Doing it for an entire film industry is impossible. If you spot a mistake in an article or review, give the poor blogger a break and POLITELY point out the mistake in the comments. Back up your information by providing a link to your source of information. This way the blogger can correct the original article in confidence and to the benefit of everyone. Thanks for that #13 Chris - appreciate it. 🙂 #4 - Don't read many magazines... Subscription costs + shipping time from UK is just a pain. I'd rather read a book with my free time than a mag. Only ever read Wired occasionally. I really hate motion capture... Fortunately Peter Jackson is working on this film, the one guy left on the planet that realises mo-cap is only a tool to be used with animation. There's 18 months of special effects and animation going into Tintin, yet news articles still bill it as a motion capture film. Ridiculous. I really can't wait for Tintin... and the sequels. #13, actually there's only going to be one film, but Peter Jackson is still working on the second in hopes that he can convince the studio to do another. He still wants to do a trilogy, and even said in one interview he might even do go as far as a tetralogy (the moon books would be film 4). #16 - Mark You've nicely demonstrated the problem for film bloggers. The last big press release from the studio [ http://news.prnewswire.com/DisplayReleaseContent.aspx?ACCT=104&STORY=/www/story/01-26-2009/0004960578&EDATE= ] stated: "The second feature in the series is scheduled to be directed by Jackson, with a potential for a third film as well." Then, a few weeks later in the Spielberg special Empire magazine, it clearly stated that the the third film had been dropped. Does this mean that they are going to be making two films or three films, or as you suggest, four films? Or is it only one film because Jackson hasn't yet started on the script of his film? There is no 'right' answer but as funding is clearly in place for two films and there are two directors lined up, then two films seems to be most sensible answer. You know, I have been coming to FirstShowing.net for at least three years. I have not always agreed with the reviews or the occasional use of off-colour language but here I am. This is one of the best movie web sites ever. I am always entertained and informed and it doesn't cost me one penny to read it. I love it. Get off the guys backs and instead marvel at what a bit of hard work and dedication can produce. #17... I just judge these things by whether a film is greenlit or not. Yeah, the funding may be in place, but it doesn't really mean anything until stuido heads give it the OK. At this point, the second film is still yet to be greenlit (as far as we know...) Of course, I want four, so when Peter Jackson says, he'd like there to be "three maybe four" I'm ecstatic. #18 So true.